Thank you, Blazena, my friend for 25 years! I have eaten your delicious meals many times but this time was special! My 3 daughters arranged for Blazena to cater my 75th Birthday brunch. She did all the cooking in my daughter's New York apartment. Everything was made fresh for 14 people. The menu was tailor-made for the children, vegetarians and those who had a sensitivity to egg yolks and certain salad dressings. 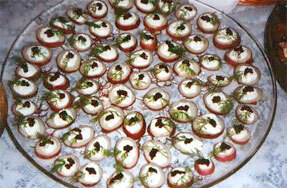 Blazena made my favorite Hors d'oeuvre which is Red-potato-caviar boats. I have never known anyone else to fix caviar this way and it is superb. The hot artichoke dip was excellent too. I loved the salad with pears and walnuts which gave the endive and frisee a unique wonderful flavor. The Penne Primavera was most tasty with the fresh vegetables. And the braised Chicken with sauteed bacon and other ingredients made for an exciting dish. Shrimp Scampi has always been a favorite of mine, but Blazena, your was the best I have eaten! This delectable buffet was topped off with a most elegant angel food cake "short cake" style with fresh strawberries and iced with whipped cream, especially designed by Blazena and superbly executed by the Wyckoff Bakery. Blazena is a master chef with many creative ideas. She has a pleasing way of serving and a very vivacious personality. It is a pleasure to have her around. My daughters, their husbands and my sister and her husband all thought the whole meal and presention was excellent. The celebration was a great "package deal", as Blazena's partner, Bill, is a professional photographer. He captured the entire affair in lovely pictures and took great photos of the whole family. All in all, it was a marvelous afternoon. Thank you both for such a special event!